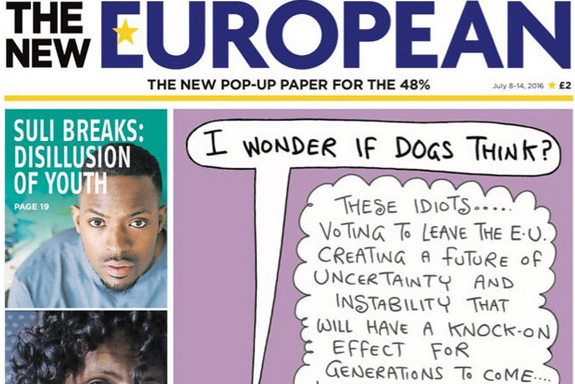 The New European newspaper, the pop-up title catered for disappointed voters in the recent UK vote to leave the EU, will continue to publish after its initial run of four weeks. The weekly paper, published by Archant, will continue to publish on a rolling weekly basis after exceeding its sales targets and making a profit. Promoted as the newspaper for the 48% of UK voters who wanted to remain in the EU in the 23 June referendum, the title went from concept to newsagents’ shelves in nine days. It is thought to be the fastest newspaper launch in UK history. Priced at £2 per issue, the first edition of The New European is believed to have sold around 40,000 copies. Its distribution is focused on London, Liverpool, Manchester, the south of England and other areas where a majority of people voted to remain. Writers and contributors to the newspaper have included Peter Mandelson, the former Labour MP and EU trade commissioner, and The Guardian columnist Jonathan Freedland. Will Hattam, the chief marketing officer at Archant, said: "Pop-up publishing is something that only Archant could have delivered. We have the scale to produce a quality print product for a national audience, but also the agility to turn things around fast and cost-effectively enough to profitably service a community that’s popped into existence overnight. "We’ll only produce the paper for as long as our readers still want it."